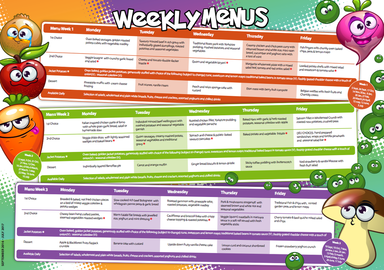 Your child can choose from two main meal options provided every day, each one accompanied by a vegetable choice, and including a daily vegetarian dish. Jacket potatoes with an assortment of popular and tasty fillings are always available too, served with an attractive side salad. Every child in Reception, Year 1 and Year 2 classes are now entitled to a free school meal under the government’s universal infant free school meal scheme. This is not means-tested.